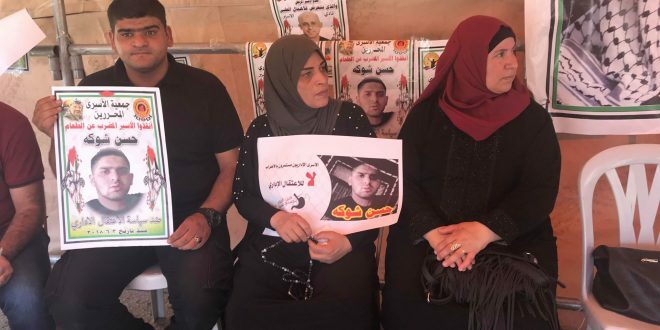 Various prisoners ‘institutions in the Bethlehem governorate on Wednesday organized a protest in solidarity with prisoner Hassan Shoka (30) who has been leading a hunger strike for 60 days today against administrative detention. According to the Palestinian Committee of Prisoners’ Affairs, the judge of the military appeals court in Ofer had frozen the administrative detention order. However, chairman of the committee, Issa Qaraqe, said that the prisoner has not suspended his hunger strike despite the court’s freeze decision, saying that the it was only Israeli game until the health situation improved. He said that he will continue his hunger strike until he is released from Israeli jail. Shoka’s health situation has been deteriorating since the as he has lost his sight and ability to walk due to the strike. Four other prisoners have also been on hunger strike for nearly two weeks in protest against the policy of administrative detention. The Israeli occupation forces arrested Shoka on September 28, 2017 and held him in administrative detention. On October 11, 2017, Shoka announced that he would be going on a hunger strike. The hunger strike lasted for 35 days, at which time it was suspended after converting his file into a case. He was released on June 3, 2018, but the occupation authorities then returned him to arbitrary administrative detention. He announced the same day that he would be going on hunger strike until his release. Shoka has spent twelve years of his life in Israeli prisons; eight of them in administrative detention.